Singapore (103.868E 1.296N) was Britain's Gibraltar of the Far East, completed at great expense just in time for the Pacific War. Its architects assumed that a land attack down the Malaya Peninsula was militarily impossible, and its defenses were oriented against a sea attack. Singapore defenses included, on the north tip of the island: 3 batteries of 2 6” naval rifles, 1 battery of 3 9.2” naval rifles, and 1 battery of 3 15” naval rifles; on the south tip near the city, 4 batteries of 2 6” naval rifles and 1 battery of 3 9.2” naval rifles; and on the west tip, 1 battery of 2 6” naval rifles. All were sited in steel casemates. The huge dry dock at Changi Naval Base was large enough for any warship in the British Fleet, and the island was dotted with four airfields. The cost of all this work was 60 million pounds, equal to about three billion 1997 dollars. The main civilian port, Keppel Harbour, was located on the southern coast, and the main fuel depot was on Bukum Island (103.750E 1.232N). The island became a British colony at the instigation of Sir Thomas Raffles, who feared growing Dutch influence in the area. In 1819, Raffles resolved a dispute over the Sultanship of Johore in return for a treaty from the new Sultan giving the British the right to establish a trading post in return for a lease of $8,000 a year. Singapore was strategically located for a major naval base, but in other respects it was an unfortunate choice. It is nestled against the mainland and surrounded by islands, and it had little industrial infrastructure in 1941. A bad situation was made worse by poor planning: The naval base was situated in the Johore Straits, just across from the mainland. The coastal batteries, although capable of firing on the mainland, were supplied primarily with armor-piercing shells, which were almost useless in land warfare due to their tendency to penetrate deep into the ground before detonating. The population of 550,000 had nearly doubled from an influx of refugees, taxing the limited fresh water supplies. The bottom line was that Singapore was indefensible without control of the air and seas around it. Control of the air was denied by the swift capture of northern Malayan airfields by the Japanese and the superior quality of Japanese air forces, but more so by the decision of Churchill to divert 200 Hurricane fighters to Russia to prevent a collapse. Control of the seas was denied when Force Z, the Prince of Wales and Repulse, were sunk in the first few days of the war. With their loss, and with no prospects of naval reinforcements, Singapore ceased to be of any value as a naval base and fortress, but it was politically impossible for the British to abandon the base. Instead, 17 Indian Division and 18 Division were sent as reinforcements, but without time to acclimatize and be integrated into the defense, this "was tantamount to marching [the] soldiers straight off their ships into Japanese prisoner-of-war camps" (Willmott 1982). 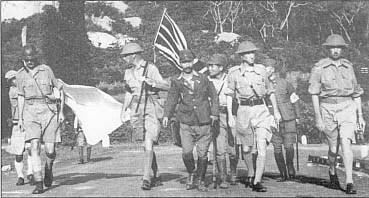 All British forces in Malaya had been withdrawn to Singapore by 4 February 1942, when the first surrender demand from the Japanese was rejected. On the night of 8 February, elements of the 5, 18, and Imperial Guards Divisions successfully crossed the Johore Straits and established beachheads against the Australian 22 Brigade. The city was surrendered on 15 February 1942, after the capture of the reservoirs by the Japanese cut off the water supply. A number of atrocities occurred during the campaign. On 13 February 1942, the Imperial Guards bayoneted over 300 doctors and patients at Alexandria Barracks Hospital. Following the surrender, the Kempeitai perpetrated the Sook Ching ("purification of the area") in which between 6000 and 50,000 Malay Chinese were massacred. The survivors were ordered to pay $50 million as what amounted to "a ransom for their lives" (Collingham 2011). Hicks (1994) has suggested that the accompanying demand that the Chinese community provide "comfort" to the Japanese occupation forces was a demand for comfort women. Following its surrender, the Japanese renamed Singapore Shōnantō. The city remained in Japanese hands until the final surrender. It was periodically raided by B-29s from 5 November 1944 on. A British plan to recapture Singapore, Operation MAILFIST, could not be carried out before the Japanese surrender.